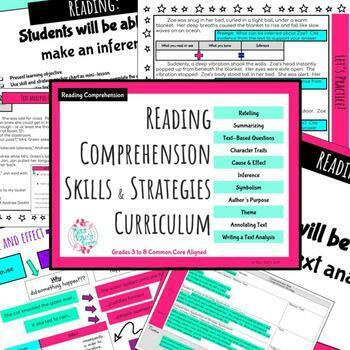 Reading Comprehension Skill & Strategies Curriculum teaches reading comprehension skills with strategies! What is included with each skill? Is there a Scope & Sequence to the Reading Comprehension Strategies Curriculum? It is suggested that you begin with the “Reading” lesson and end with the culminating lessons of “Analyzing and Annotating Text” and “Writing Text Analysis”. When teaching “Symbolism”, a class will have learned how to summarize and identify theme first. Otherwise, you can pick and choose the skill you wish to teach in any order. How do I know how to teach the strategy? 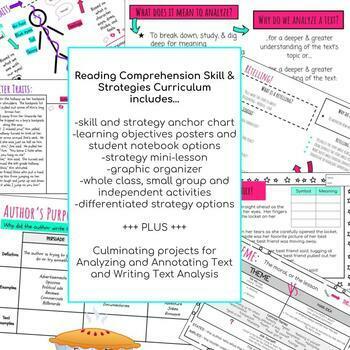 A Reading Comprehension Strategies lesson plan is included to be used multiple times for whole class mini-lessons and as small guided reading group plans. Notes and tips are included with the lesson plan to help your planning! Can I use this with any text? -Yes! Most of the strategies can be applied to both fiction and non-fiction texts. The skill of character, for example though, is not applicable to non-fiction so there is not a character strategy compatible for non-fiction texts. 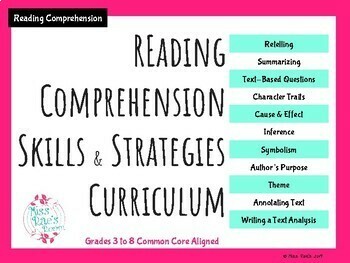 What grade levels can I use the Reading Comprehension Strategies Curriculum with? -The Reading Comprehension Strategies Curriculum was designed for grades 3 through 8. It is Common Core aligned! Check out my other products AND become a follower!